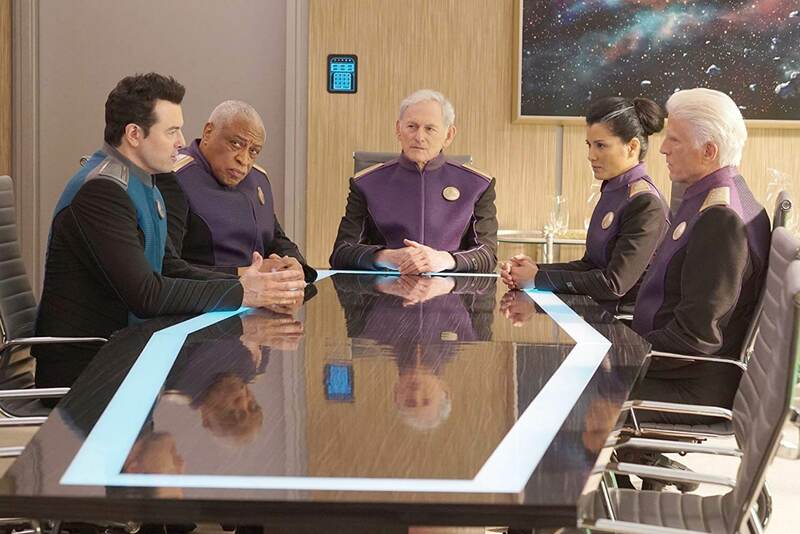 The Orville is back, and if “Sanctuary” is any indication, the last few episodes of this season are going to be wild. “Sanctuary” starts with what appears to be an intimate story harkening back to the show’s early days, but it escalates into another epic culture clash with another moral dilemma for Ed, as well as for the Union as a whole. Two Moclan engineers board the Orville to beef up its artillery in preparation for war with the Kaylons, but they’re hiding something that could bring the ship a lot of trouble. Bortus once more comes into conflict with Klyden and Moclan culture. Topa gets into trouble at school. The conflict with the Kaylons from the “Identity” two-parter continues to inform the rest of the season, as “Sanctuary” begins with the revelation that Moclus has been the Union’s primary source of arms. Now that the Kaylons want to exterminate all sentient life in the universe outside of themselves, Moclus is a more vital ally than ever. As such, Ed is told to afford every courtesy to the engineers sent to deck out the Orville in the latest Moclan weaponry. But we don’t even get to the opening credits before learning that these two Moclans are hiding something, and whatever it is, it’s sure to cause Ed some more grief. 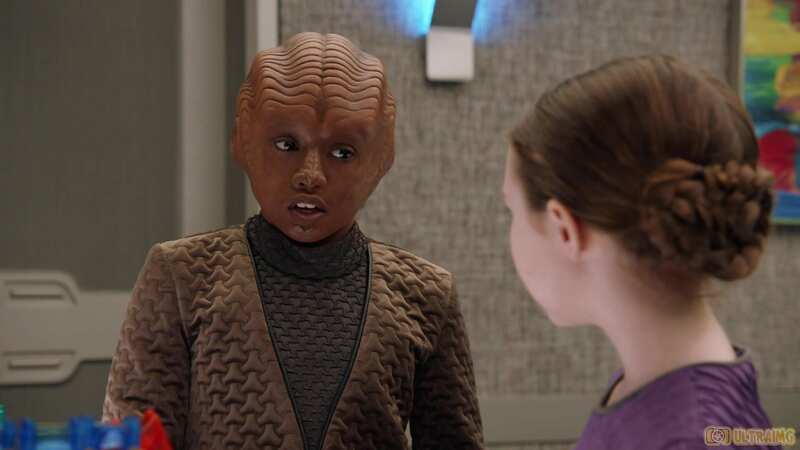 Moclan culture has come up a lot throughout season 2, but to the show’s credit, it continues to find new ways to bring the Orville’s crew into conflict with the Moclans. This time, an old thread is revisited, and a stinging loss may have the opportunity to be avenged. The two Moclans are harboring a baby girl, and are desperate to bring their daughter to a planet where they will be able to claim sanctuary and raise her without having to put her through gender reassignment surgery. Bortus is the one who first discovers their secret, and he is once more caught between the culture he was born into and the one he’s embraced aboard the Orville. The engineers beg him not to tell Ed what they’re doing, and Bortus agrees, helping to save the little girl as he was unable to save his own child. His mistake is in trying to show his son the baby. Topa has been having trouble in school, and the Moclan views of women – cheerfully imparted on him by Klyden – are the reason. Bortus wants to show Topa the baby to make him see women as people too, but his conditioning overrides the lesson, and he turns Bortus in, Klyden at his side. This is where “Sanctuary” gets really fascinating. While investigating the engineers and their baby, Ed and crew stumble upon a hidden settlement of Moclan women who have escaped their oppressive homeworld, and it’s led by Heveena, the Moclan writer who tried to help save Topa in “About a Girl.” It turns out women aren’t as big an anomaly as the Moclan government insists they are, and Heveena has been helping them escape Moclus for years. Since word of their location will inevitably reach the Moclans, she prepares to evacuate, but Ed has a better idea: ask the Union to recognize them as an independent state, which would place them under Union protection. It’s going to be tough, though, because Moclus doesn’t take kindly to having fugitives from their world be allowed to argue for their freedom. Once more, Ed is caught between Moclus and a hard place, and he’s got the entire Union right next to him. On the face of it, it’s obvious that the Union should side with Heveena and the other women and protect them from the ignorant barbarians who would mutilate and unperson them. However, the Moclans throw everyone a curveball when they threaten to leave the Union and keep their Kaylon-fighting weapons to themselves. They even suggest that they will offer the Krill an alliance in the event of another Kaylon attack, knowing that the bloodthirsty Krill will much more readily team with the Moclans than with their bitter enemies, despite the Lak’vai Pact. This puts yet another spin on the many cultural disconnects between the Moclans and the rest of the Union; how much do you put up with to ensure your own safety, as well as the safety of every other civilization in the universe? Is protecting the Moclan women worth facing annihilation at the hands of the Kaylons? Lots of lives are at stake, and it’s not an easy decision to make. “Sanctuary” examines the culture clash on a more intimate level through Bortus and his family. As Bortus is working on the bridge all day, Topa is spending most of his time with Klyden, who is teaching their son all the finer points of Moclan culture, not the least of which is the inferiority of women. Now Topa is stealing from girls in his class and, when challenged, shoving them to the ground like they’re nothing. His indoctrination is so strong that, when Bortus makes him promise not to tell anyone about the Moclan baby girl, Topa breaks his word and tells Klyden. Again, Bortus contends with his husband, and the two are now locked in a battle for Topa’s soul. Bortus is no longer as conflicted as he once was, fully embracing the more enlightened views of his crewmates; his observation that Klyden refused even to acknowledge Kelly, the second-in-command of the entire ship, is the perfect representation of Klyden’s refusal to budge. The final scene offers hope for Topa, but I doubt their conflict is anywhere near over. There is much to love in the excellent “Sanctuary.” The resolution to the Moclan stand-off works on several levels. It uses the Moclans’ weaponized fear of the Kaylons against them, showing not only how real the Kaylon threat is, but how human even the most savage of cultures is under the surface. It also makes clear that the women of Moclus are now a significant force, significant enough to be the face of Moclan culture forever if the men are wiped out by the Kaylons. And, finally, it’s a true compromise; the women don’t get everything they want, and while they’ll be able to live in peace, they won’t be able to rescue any more girls. I also adore the use of Dolly Parton’s “9 to 5” as the battle hymn of the resistance; in addition to triggering some immensely funny scenes, it shows how much inspiration art can give to someone, even something as silly as Dolly’s ode to the working woman. Heveena honestly finds inspiration in the song, and while her quoting lyrics at a Union meeting is hysterical to us, it means something to her. Speaking of which, “Sanctuary” made me realize something about the humor this season; it may be funnier because it’s less frequent. For the first half of “Sanctuary,” I remarked how little comedy there was. Then Heveena discovered “9 to 5,” and I found myself roaring with laughter, perhaps in part because I didn’t expect it, having acclimated to the more serious tone of the episode. Then, there’s a moment where Admiral Halsey orders Ed to tell Kelly not to engage the Moclan warship but suggests that maybe his message won’t get through; Ed has one of those moments where he doesn’t get the implication until, suddenly, he does. I laughed hard, again maybe because I didn’t see the joke coming. This is wonderful writing, structuring the plot so that the comedy comes out of nowhere and lands all the better for it. Seth MacFarlane’s delivery is part of what helps sell it, of course, and he once again gives a great performance. Ed’s frustration with Moclan culture returns in “Sanctuary,” and now he’s got to contend with bureaucrats who don’t see the human element as well as he can; likewise, Ed doesn’t have the same perspective of the admirals, and can’t see the bigger picture until they make it clear to him. MacFarlane brings such humanity to Ed, and his admonition that abandoning the women would be abandoning everything the Union stands and fights for is one of his finest moments. Peter Macon stands out too, showing Bortus’ strengthening resolve in terms of his ethics. He also seems to be reaching the end of this tether when it comes to Klyden (who, by the way, I’m done defending; he’s a miserable, hateful, self-righteous creep and I hope he gets his at some point), and I’m curious to see where The Orville goes with their marriage. Finally, Rena Owen crafts an intriguing figure with Heveena; she’s angry and scared, but also good-humored and kind. She immediately welcomes Ed and his crew to her home and is grateful for all the help they gave her on Moclus. She can shift between these emotions with seeming ease, often in the same scene, and she’s marvelous. I also got a kick out of seeing all the admirals together, as well as guest stars like Marina Sirtis, Tony Todd, and the great F. Murray Abraham. The talent The Orville attracts is exceptional. That extends behind the camera as well; Jonathan Frakes directs “Sanctuary,” and he delivers some great action amid the political turmoil. There are space battles above the women’s colony, as well as a big shootout on the ground as Kelly and Bortus defend the women from a team of soldiers (set, as it had to be, to “9 to 5,” mixing comedy with a tense action sequence). It’s not as epic as “Identity, Part 2,” but it’s a gripping climax, and much more satisfying than that of “All the World is Birthday Cake.” “Sanctuary” is a stupendous episode. If not for “Identity,” “Sanctuary” would be the best episode of The Orville yet. It presents another Moclan-centered moral dilemma for Ed, but in a fresh and more complex way than has been done before. There’s pulse-pounding action, perfectly-timed comedy, excellent performances, and more guest stars than you can shake a starship at. 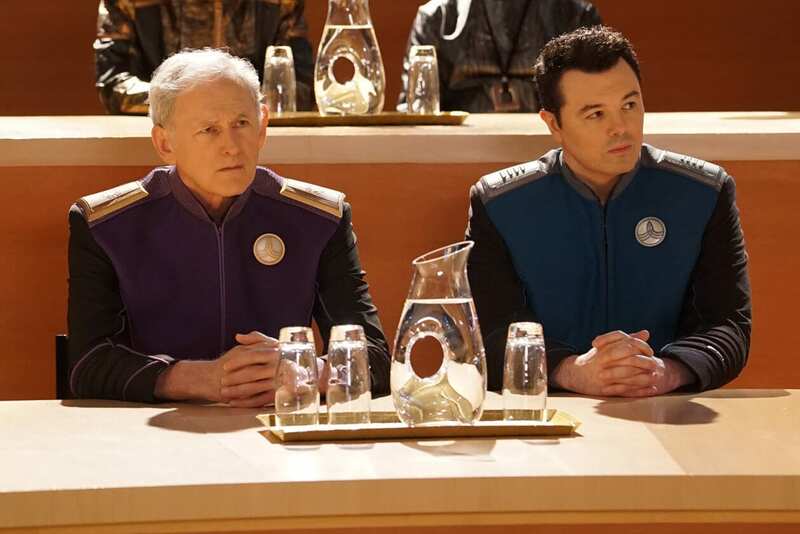 Season 2 got off to a rocky start, but The Orville’s ship has been righted expertly, and the next two episodes have me biting my nails in anticipation. If not for “Identity,” “Sanctuary” would be the best episode of The Orville yet. It presents another Moclan-centered moral dilemma for Ed, but in a fresh and more complex way than has been done before. There’s pulse-pounding action, perfectly-timed comedy, excellent performances, and more guest stars than you can shake a starship at.